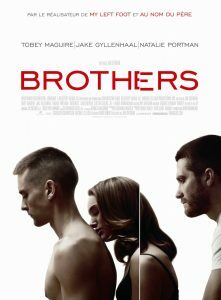 Plot Summary: The story centers on a man (Maguire) who is sent to fight in Afghanistan while his black-sheep brother (Gyllenhaal) cares for his wife (Portman) and child. – The film is a “based on” Susanne Bier’s 2004 Danish film of the same name. – On doing a remake, Natalie said: “I actually haven’t seen it yet either. I’m not sure if I will because I’m a little scared. I’m always scared that my whole performance will be dictated by either trying to do the same or trying to do something different than what I see someone else do.